Cupping or Cupping Therapy refers to an ancient Chinese practice in which a cup is applied to the skin and the pressure in the cup is reduced (by using change in heat or by suctioning out air), so that the skin and superficial muscle layer is drawn into and held in the cup like a vacuum. This vacuum on the patient’s skin is performed to dispel stagnant blood and lymph, thereby improving qi and blood flow to promote healing and eliminate toxins from the body. 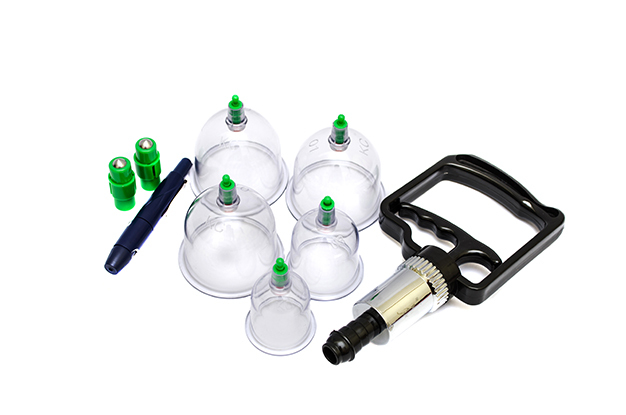 Cupping therapy is commonly used to treat respiratory diseases such as the common cold, asthma and bronchitis. 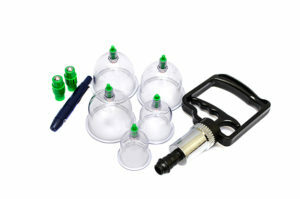 Cupping also is widely used for back, neck, and shoulder pain. It also dispels toxins from the body. In some cases, the cup may be moved while the suction of skin is active, causing a regional pulling of the skin and muscle (the technique is called gliding cupping). Traditional Chinese Cupping Therapy or Fire Cupping, with use of heated cups, has some similarity to moxibustion therapy. Heating of the cups was the method used to obtain suction: the hot air in the cups has a low density and, as the cups cool with the opening sealed by the skin, the pressure within the cups declines, sucking the skin into it. In this case, the cups are hot and have a stimulating effect something like that of burning moxa wool. Sterile cups are kept in place for a few minutes and are painless and safe. Skin is never damaged during treatment. Therapeutic affect can be immediate in many cases. Modern Chinese Cupping Therapy came about during the 20th century, when new glass cups were developed. The introduction of glass cups helped greatly, since the pottery cups broke very easily and the bamboo cups would deteriorate with repeated heating. Glass cups were easier to make than the brass or iron cups that were sometimes used as sturdy substitutes for the others; further, one could see the skin within the cup and evaluate the degree of response. The glass cups are depressurized by providing some fire in the cup to heat up the air within just prior to placement. For example, hold a cotton ball dipped in alcohol with a pincer, ignite it, hold it in the cup, then rapidly apply to the skin; this is called shanhuofa (flash-fire cupping). Sometimes, a small amount alcohol is put in the cup and lit; this method is called dijiufa (alcohol-fire cupping). Suction Cup Therapy – At the end of the 20th century, another method of suction was developed in which a valve was constructed at the top of the jar and a small hand-operated pump is attached so that the practitioner could suction out air without relying on fire (thus avoiding some hazards and having greater control over the amount of suction). Both glass and plastic cups were developed, though the plastic ones are not very well suited to moving along the skin once in place, as the edges are not entirely smooth and the strength of the cups is limited. The modern name for cupping is baguanfa (suction cup therapy). Generally, the cup is left in place for about 10 minutes (typical range is 5 – 15 minutes). The skin becomes reddened due to the congestion of blood flow. The cup is removed by pressing the skin along side it to allow some outside air to leak into it, thus equalizing the pressure and releasing it. Some bruising along the site of the rim of the cup is expected. Today, cupping is mainly recommended for the treatment of pain such as back pain, neck pain and shoulder pain. It is also commonly used for gastro-intestinal disorders and lung issues such as cough and asthmatic breathing. It can be used for other disorders as well. The areas of the body that are fleshy are preferred sites for cupping therapy. Contraindications for cupping therapy include: areas of skin that are inflamed; cases of high fever, convulsions or cramping, or easy bleeding (i.e., pathological level of low platelets); or the abdominal area or lower back during pregnancy. Movement of the cups is limited to fleshy areas: the movement should not cross bony ridges, such as the spine. At our clinic in Margate we typically use cupping therapy as an adjunct treatment along with acupuncture and Chinese herbal remedies. We find this to be the most effective method of treatment for certain conditions. If you’d like to try cupping therapy for your specific condition, please schedule a free consultation with one of our acupuncturists to learn how you may benefit from cupping. Consultations are free, we are open 6 days a week and we proudly serve the communities of Margate, Coral Springs, Coconut Creek, Pompano Beach, Parkland, Tamarac and Boca Raton. Read about a patient’s experience with Chinese Cupping to relieve sciatica.